We have displayed the Hina dolls here at the Naramachi Guesthouse. Hina dolls are the dolls to celebrate the girls’ day on March 3rd. 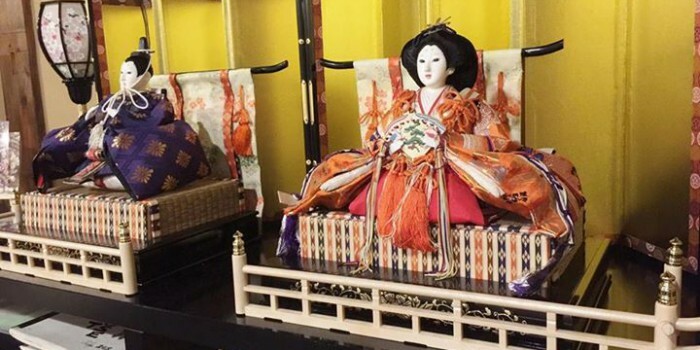 Many households decorate the house with the simple queen and king set or the whole set with several other dolls. These Hina dolls were given by a grandmother to her first granddaughter. Her story has always been the same since the granddaughter was born. “I’m so grateful that I have a granddaughter to whom I can give these dolls! I’m so happy that you display them at home! There is no happier thing in my life than seeing my granddaughter growing up! She remembers all the different memories from past hardships since before the World War through these Hina dolls. The memory of her house burning down, the time when she was struggling to make a home after having children… she repeatedly appreciates the happiness she can enjoy right now because she didn’t have anybody to celebrate anything together with before. This Hina doll festival is an event which we have celebrated and will celebrate for decades to link the family together.